ICO’s – The New Crowdfunding Platform: Caution, Speedbump Ahead. 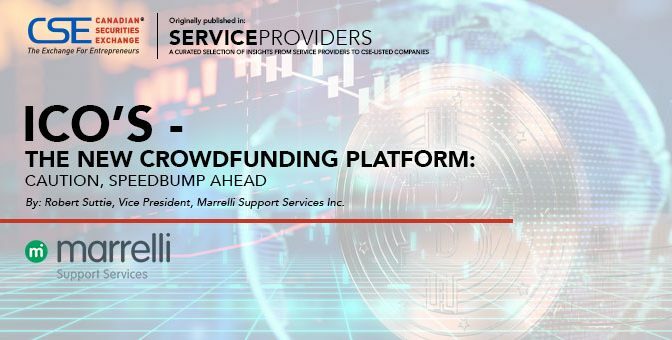 As reported by the Globe and Mail on October 23 2017, the Ontario Securities Commission (“OSC”) has approved an Initial Coin Offering (“ICO”), to TokenFunder, representing its first foray into the land of crypto crowdfunding. Responding to the markets appetite for ICO based financing, and the inherent need to develop a regulatory framework within which they will operate, the Canadian Securities Administrators has instituted a twelve month exemption to TokenFunder from the requirement to register as a securities dealer. This funding platform is not without risk. The underlying cryptocurrencies issued in conjunction with ICO’s may not be classified as securities. They do not convey ownership rights of a company, as is the case with the more traditional common shares, warrants, or other equity instruments. Instead, they tend to carry with them access rights to a product or platform which has been or will be developed by the issuing company. There is no guarantee the initiative(s) will ever be completed or commercially viable. Furthermore, ICO’s remain in regulatory purgatory while governments, securities commissions and exchanges struggle to understand the ICO model and how best to fairly regulate it. When a company undertakes to complete an ICO, it creates its own cryptocurrency and sells a portion of it under the terms of the ICO. In a perfect situation, the company builds its platform, is commercially accepted, and demand for their digital currency surges, resulting in an appreciation of value for those holding their digital currency. Cryptocurrencies are designed from the start to share some fundamental characteristics of precious metals. After their initial issuance, the volume of additional cryptocurrency issued in a given series is structured to decline over time, creating what amounts to engineered scarcity. This, coupled with potential success of the underlying platform which forms the basis of the ICO, can generate exponential growth in value of the cryptocurrency itself. Perhaps the best known cryptocurrency, Bitcoin, introduced January 3, 2009 demonstrates the pinnacle to which all ICO’s strive to achieve. As of November 7, 2017, each Bitcoin in circulation is valued at CAD$9,510 each, benefiting from a wildly successful platform, and engineered scarcity, coupled with worldwide acceptance as a conveyance and store of value. It’s important to note, however, that Bitcoin was first on the scene in 2009, prior to the explosion of the ICO crowdfunding demand. While Ontario has just now approved its first one, the number of ICO’s worldwide has exploded, showing no signs of slowing any time soon. With so many cryptocurrencies and platforms emerging, it is uncertain what the impact on individual investors will be as engineered scarcity, one of the fundamental pillars of the cryptocurrency model, is challenged by an explosion of digital currency entrants. Bitcoin now finds itself facing challenges as its own success has sparked scrutiny. More and more, digital currencies are utilized as the monetary conveyance of choice for criminal activity. Many countries have begun the process of formulating policy with respect to cryptocurrencies and ICO’s, with a few restricting or banning outright certain cryptocurrency or ICO activity. As these digital currencies exist outside the influence of governmental monetary policy with central banks unable to manage what may soon prove to be a significant element of the money supply, regulatory concern continues to mount. Furthermore, with significant and rapid appreciation in value, comes the question of unsustainable demand, further strengthening the mandate of the regulators. As the OSC blazes its path towards regulating ICO’s in Ontario, investors find themselves faced with opportunity and a degree of uncertainty as the nature and extent of these regulations are as yet unknown. This story was written by Robert Suttie, Vice President of Marrelli Support Services Inc. and featured in Service Providers magazine. Industry “OG” and CEO of Dixie Brands, Chuck Smith, recently sat down with Barrington Miller as part of Public Entrepreneur’s #WeedWeek podcast series. In this discussion Chuck shares why Dixie decided to focus on infused products and stay away from farming and cultivation (3:15), how the early origins of the company in medical cannabis have been integral to their efforts to build a portfolio of recreational product offerings (7:30) and the recent launch of CBD products for dogs AND cats! Listen until the end to learn about Chuck’s pioneering work on the Cannabis Trade Federation, his thoughts on cannabis taxation (ed. more interesting than it sounds), and their “transformative” JV with Khiron Life Sciences in Latin America.